Bastion isn't the only game coming to Google Chrome: Square Enix has a slew of titles coming to the browser, starting with Mini Ninjas. Now that Supergiant Games has revealed that Google Chrome is the latest platform to play quality games like Bastion on, it's time for other groups to get on the bandwagon. 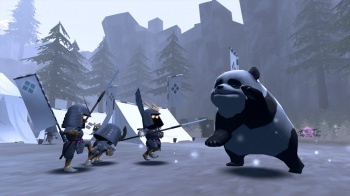 Enter Square Enix, which has just announced that Mini Ninjas - the adorable action adventure title from 2009 - is going to be ported to Google's browser. According to Square Enix, the game will compatible in the soon-to-be released version 17 of Chrome (which is due out in a couple of weeks). The game is due to be released sometime within 2012, but an open beta of Mini Ninjas will begin sometime this month. Mini Ninjas is only the first game that Square Enix plans to bring into Chrome, though details about additional content is sparse, at best: "Additional titles from Square Enix's group-wide lineup are planned to be made available in the browser within the next year." If you're interested in signing up for the beta, you can do so at the official Mini Ninjas website.